As our favourite line goes, with great power comes great responsibility. In a high-performance and high-pressure corporate environment, a manager needs to be a SuperMan-ager in order to meet client expectations and delivery schedules while keeping the team motivated and inspired. Our SuperMan-ager program addresses exactly this and has been tailored for three different levels - Beginner, Pro and Elite. Beginner (Managing yourself & your Team) (2.5 days) – This level includes fun learning sessions to equip newly promoted first time Managers with the managerial competencies of delegating, managing and motivating your team, while handling client relationships and delivery timelines. Pro (Managing your Managers) (2.5 days) – Specially designed for Senior Managers who manage large accounts with multiple managers or manage an entire business unit, this program emphasizes on two things: (i) The entrepreneurial behavioural traits and building a culture of ownership and accountability using theatre role plays and live case studies and (ii) Using incentives and performance discussions effectively, and making the move from being a boss to being a coach and finally a mentor. Elite (2.5 days) – As a senior leader, one is in a position of influence and hence there is a need to develop the behavioural traits of a CEO. Inspirational leadership through executive presence, leading change in a VUCA environment and ‘Thinking Big’ for the organization are some of the key messages covered in this workshop through live case studies, simulations and theatre techniques. Our Team Building workshop helps build high performance teams with the learning focused on fostering open and effective communication, building trust, inspiring collaboration, roles and responsibilities allocation for maximum output and so on. Fundamental to a high performance team is understanding the team members’ motives and aligning them with the team’s goals. We explore different leadership styles - authoritative, participative and delegative - to understand the fundamentals of building a successful team. With an objective to break silos, tear down walls and enable teams to feel, think and work as one, this module consists of activities, games and theatre-based tasks to enable the teams to ‘bond’ and get energized. The workshop focuses on building trust, empathy and a desire for a mutual win-win goal by making them recognize each other as people with strengths and weaknesses rather than as colleagues with designations and hierarchies. In this kind of a safe environment, participants lose their inhibitions, build trust and are able to work together, which helps solve larger problems at hand. One of the crucial enablers of success – professional or personal - is time management, but managing your time is easier said than done. This workshop helps managers understand how to manage not only their own time well, but also that of their subordinates and bosses. This workshop helps managers understand the tenets of managing their own time, their subordinates’ and their bosses’ time to become more effective. Understanding time as a constant, and learning tools and techniques to enable prioritization, delegation, reducing time wasters, scheduling and keeping commitments, will allow one to get more done within the available time. Time management also enables a healthier work-life balance! A key skill for a leader is the ability to negotiate effectively. The frameworks and tools that help negotiate with customers, suppliers, partners and stakeholders to get maximum value are an essential part of this workshop. Tools like BATNA (Best Alternative to a Negotiated Agreement), Mirroring, PowerStatus and Win Win are taught using theatre, role plays and simulations to help you become a better negotiator! 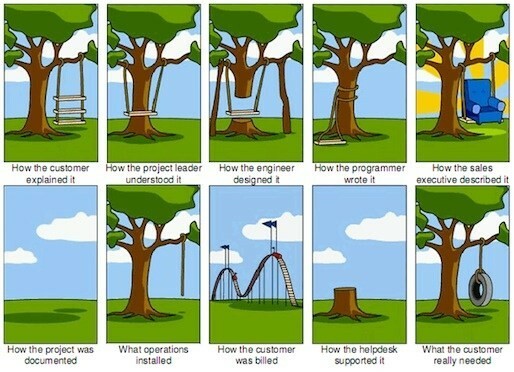 We’ve all seen this illustration and experienced it (when it probably wasn’t funny!) at some point. The Customer Service 2.0 at Sideways addresses exactly this. Not just focusing on the customer and serving them, but advocating for them – this is the new perception this workshop gives. It covers all the steps of customer service – research, connect, convince, create, deliver, service and follow-up – through role-play. This helps the participants understand exactly how the customer perceives the process and hence infer customer oriented behaviours required to build long-term relationships with the customer. The most common barrier to creativity and innovation is fear – the fear of rejection or failure through resistance or criticism. In this program, we use games and theatre based activities to lower barriers and inhibitions, encourage thinking outside the box, and present and sell these ideas. A vast variety of topics are covered such as types of innovation (breakthrough, adaptive-adoptive, disruptive), how to nurture an environment of creativity and how to thrive in this dynamic world. The Super Salesman program has been tailored for three different levels - Beginner, Pro and Elite. The entire sales process - starting from understanding the market, finding your target customers and leads, planning the sales strategy, pitching your product to them to sell, following up with these leads, negotiating, converting them to customers by closing the sale and finally nurturing the customer relationship - is covered in Super Salesman 2.0. The process of sales differs for B2B and B2C companies and it is an ongoing process even after the conversion is made. At Sideways, we ensure you get the most out of this sales training workshop through improv theatre, live case studies and sales simulations! Change is an essential part of life. In the VUCA environment (Volatile, Uncertain, Complex and Ambiguous) accepting, embracing, managing and leading the change is the biggest challenge for a leader. This learning is critical to bringing about innovation through the change caused by disruption. What could be a better way to learn this than project based simulation through dance, puppetry, theatre and other art based activities? Transitioning from a boss to a coach or mentor while giving feedback. Ability to give feedback consistently and at regular intervals. Establish the process of collecting feedback – the workshop explains the 7 different steps involved in this process. We use simulations and role-plays to convert serious conversations into a fun yet productive version! Since cavemen painted on walls, storytelling has been one of the most effective ways of communication – central to human existence and taking place in every known culture in the world. It’s how we learn, instil morals and values, pass on knowledge and learning, and connect with one another. As humans, we can relate much more closely to building stories around conversations rather than just presenting facts or data. It is more personal and creates a connection. The idea behind this training is to impart skills which lead to more impactful and engaging conversations that result in success, which a mere presentation of facts could not have done. This program breaks down the art of storytelling into different techniques and uses role-play and theatre tools including the 6 frameworks of storytelling, 3-act structure etc., for a better representation of your thoughts in real life situations.